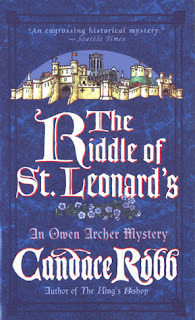 Medieval York is wrapped in a dangerous riddle that only Owen Archer can unfurl. The fetid summer heat of 1369 has the citizens of York besieging Owen Archer’s apothecary wife, Lucie, for physicks against noxious vapors. But more than pestilence is in the air. Owen is summoned to investigate the theft of rare treasures from St. Leonard’s Hospital and the untimely deaths of aging patients. What links a brutal robbery, a fatal fire, a lay sister some still call whore, and a homeless urchin who shoots an arrow as straight as Owen himself? Country lore and town gossip lead him deep into the past, toward a killer with a heart blacker than the plague itself. Unfurling such a mystery isn’t easy, and even less so at a time where there were very few tools to discover the truth… no DNA, no fingerprints… instead Owen has to rely on gossip and country lore to figure out the truth. And it’s surprisingly remarkably easy both for him and reader to do so. Despite the plot being quite complicated, the author has just shared too many hints along the way for the reader not to realise halfway trough who the culprit is, which kinda spoils the story somewhat. However, what I really enjoyed was the historical background. Robb did a wonderful job at describing what living in a city besieged by pestilence was like. The panic of the people, their running away, their desire to help the sick and the utter fear that often held them back from doing so, the remedies those who stayed employed to ward off and cure this disease, the way that pestilence affected the daily life of all the inhabitants…This book is well-worth a read just for that. 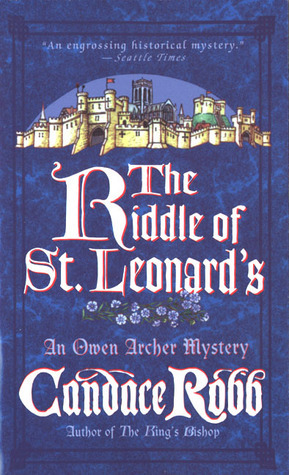 Although The Riddle Of St. Leonard has a complicated plot, the solution of the mystery and the identification of the culprit are particularly easily. The reader will easily solve the puzzle before the end of the book, which can put some people off. But the best part of the book is the social background. Set in York during an outbreak of pestilence, the author skillfully shows how people dealt with it. And it is well-written too.